"Oh my gosh! What kind of dog is that?! I want one!!" With doggles or without, the reaction is the same, and we soon end up having a talk with total strangers about breeding merle dogs. I've learned a lot about the subject in the past week, and met many new people because of it. Ordinarily I wouldn't think Luna's color was such a big deal, but she has created so much interest everywhere she goes that I figured we may as well wade into the subject here. Until we got Little Luna, I never gave it much thought. For the many years that I trained and trialed dogs, I often came across merle colored dogs and always found them to be lovely creatures. But as with breeding paint horses, I know that breeding these striking animals always comes with a risk of health problems. In the very short time we've had Luna, my eyes have been opened to the realities of these risks and although I am just beginning to scratch the surface on the subject myself, because I see the public's response to this cute pup, I feel compelled to let Luna be an ambassador on the subject so that we can nip some things in the bud. So let's start with the basics. 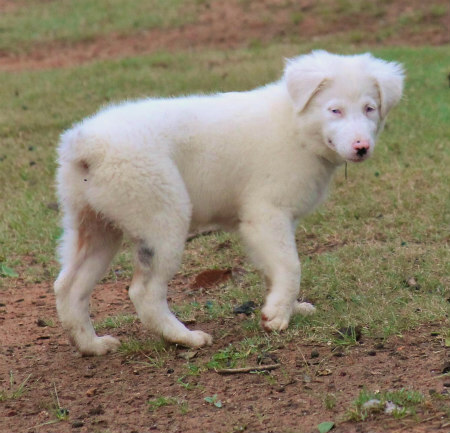 Many breeds have merle colored dogs, and as a general rule, you shouldn't breed a merle dog to another merle dog because you have the chance that 1 in 4 of the resulting pups could be deaf and/or partially blind like Luna. I honestly believe that a lot of people don't realize the risk. 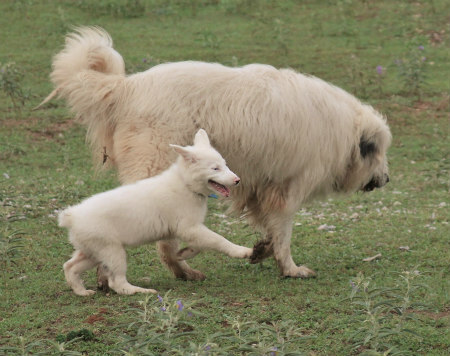 It's here where some folks start foaming at the mouth and viciously attack breeders who produce double merle pups. Folks, this doesn't help either. It blames and alienates people. I've spent my entire adult life training dogs and although I've never produced a litter myself, with that much time spent rubbing shoulders in the dog world, I can give you a few generalities about dog people. Working Dog breeders look down on Show Dog breeders and they both look down on Backyard Breeders. Rescue people look down on all breeders because they're the ones in the trenches dealing with the heartache of someone else's decision to breed two dogs. And puppies from ANY of these breeders can end up in a rescue situation. How many puppies are produced and how responsible is that breeder for his pups after they are born? Yes, many breeders of all kinds produce litter after litter with no thought to the welfare of the pups once money has exchanged hands. On the other hand, some breeders are responsible for their puppies from birth to grave. Those are the ones I consider to be responsible breeders. So let's get back to merles. We've had Luna for exactly one week now, and in that time I've met every example of the above breeders and rescuers of Australian Shepherds. 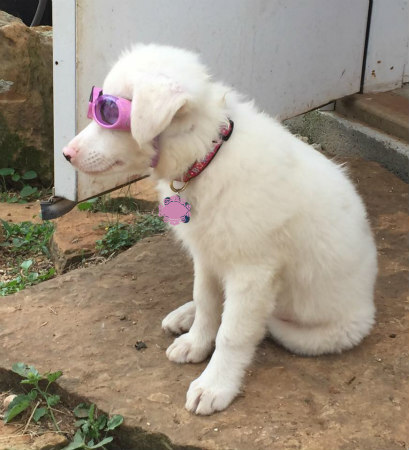 Luna came from Backyard Breeders who mistakenly bred two merle dogs and then made every effort to find responsible, loving homes for those pups. Since Luna is a pup, like any other puppy, she needs plenty of time socializing in public, and I have to say I'm stunned by the way she attracts attention. (Not always in a good way.) We've met a lot of new people because of her. We met one lady just walking through a horse show who immediately came over and identified herself as an Aussie breeder. She knew exactly what Luna was and explained that she had made the same mistake herself years ago. She placed those pups in homes and stopped breeding those particular parent dogs. We later ran across another woman who told us she'd bred Aussies for over 20 years and just euthanized all the white pups like Luna. Really?! Holy crap! Since 1 in 4 can be born like Luna, that's a lot of dead puppies. We were appalled. It's a puppy, not a product. So I ask you, who is the more responsible breeder? The breeder who lacks education, makes a mistake, but finds homes for their pups, or the breeder who produces a lot of dogs, and just euthanizes the handicapped ones? Many folks unwittingly make the mistake of breeding two beautiful dogs, unaware of the possible results, but others do it on purpose despite knowing the risk. 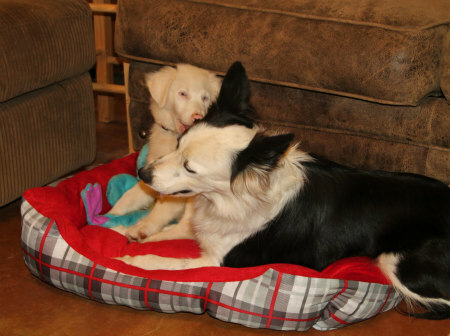 Why would anyone knowingly breed dogs that could produce deaf or blind pups? Well, after living with Luna for a week, I'll tell you why. 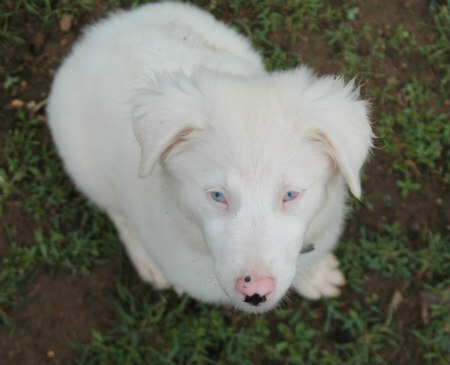 The public likes flashy, loud-colored dogs, and they flock to these white blue-eyed puppies. Because of all this attention, we are caught between trying to warn people not to breed two merles and at the same time show people that despite being partially deaf and particularly sensitive to bright light, Luna lives a very happy life and is not some accident of nature that demands pity. As far as Luna is concerned, she is just like everyone else in this family, except shorter. After all this research, would we still bring Luna into our home? She is a delight to live with, and she will ultimately make us better dog trainers as we attempt to make her life as normal as possible. For all practical purposes Luna is a normal puppy. Inside the house, and on cloudy days, she can see just fine. 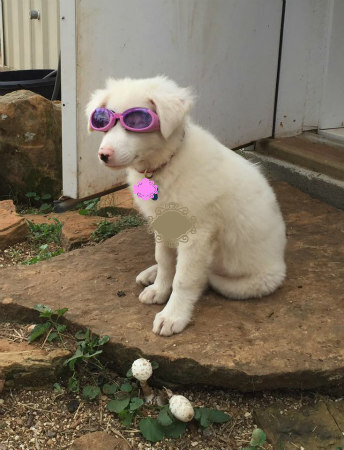 In bright light Luna wears sunglasses because her eyes are very sensitive. She can hear really loud sounds, like dogs barking or banging pans, but for the most part, appears to be deaf to sounds within the normal range. To compensate for that, we are all learning hand signals. Each morning Luna, Lily, and Mesa line up and we learn basic puppy commands in sign language. (Just wanna point out that Luna is progressing faster than the Border Collies. . . ) I think it will take longer to train the humans than the deaf dog. Our decision to bring Luna home was in no way affected by whether or not she would prove to have serious vision or hearing problems, and it makes me uncomfortable for people to praise us as saints. We're not. We're just dog people who can make a little more room for another crate and another food bowl. True saints are the folks who rescue dogs in danger. We don't consider Luna to be a 'rescue.' She's not. At no point was Luna ever in any danger. She came from a loving home and she came to a loving home. and never for one moment do we regret bringing her into our home. I felt much the same way when I took in my blind Akita. How does she react to sheep? Would she hear the old fashion dog or a shepards herding whistle? My sheep are a but uppity for her size now so she cannot play with them. A few want to stomp her and Mesa often has to intervene when the pup is in the barnyard when the sheep are loose. She was trying to work dairy goats last night. Other Half was wondering out loud if she could hear a sheepdog whistle. We'll try one today. Glad that Luna has found a good home. 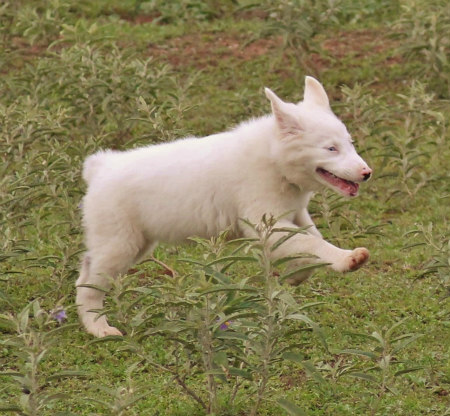 People do make mistakes in breeding and I am happy when the resulting pups are given a good chance. Sounds like she does have her herding instinct and the thought of what will happen if your sheep see a dog with doggles sort of boggles the mind. No freaking way!!! Luna's nickname is Possum! That's hysterical. Don't give up hope. We have a lot of people who think Luna is pretty cool and the deafness isn't a turnoff at all. Just a couple of thoughts for you. Can she hear and airhorn (for distance recalls possibly). How about an e-collar with different vibration settings to allow you to assign different meanings (or are they all just different intensity)? I have also heard you can train with light cues from a flashlight. I must say she is a cute puppy and she sounds adorable. I look forward to hearing about your adventures with her. I have been googling living with deaf dogs and am getting lots of tips. We just ordered her an e-collar with vibrations (no shock) so we can 'page' her to look at us for hand signals.